Isabella Babysits Baxter - A Book Review! - HAPPINESS IS WATERMELON SHAPED! Click on the book to see the book at Amazon. In a nutshell, this book tells about a day when young Isabella needs to keep Baxter, the dog, entertained while Mom, the work-at-home artist, works in her art room. Overall, my students enjoyed the story. Here are some of their comments. ...Isabella is adorable. I love, love the picture the mom painted. Baxter is adorable. I like when Isabella dressed up Baxter. The fish crackers look gross. That is a bad dog! I love when they played tug of war. 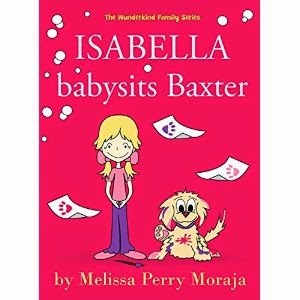 In the book I like that Isabella's favorite book is Isabella Babysits Baxter. Is it based on a true story? I like the action words...the detail in the people. Why does Isabella have blond hair and her mom have dark hair? Why did she (Isabella) not go to school? I did not like how Isabella yells at Baxter. I think you should tell who her siblings are. Several students wanted to know if this was based on a true story which opens up a discussion on realistic fiction. The kids really enjoyed the page where Isabella is reading this exact book to the dog - this was definitely a highlight in the story. The kids also appreciated the sound effect words as we pay special attention to these types of words as a way to grab a reader's interest. My class and I enjoyed this colorful and fun book and are very thankful to the author, Melissa Moraja for sending us an autographed copy!